Information Square is located in Kuala Lipis old town. A wide range of information can be acquired from this information square. 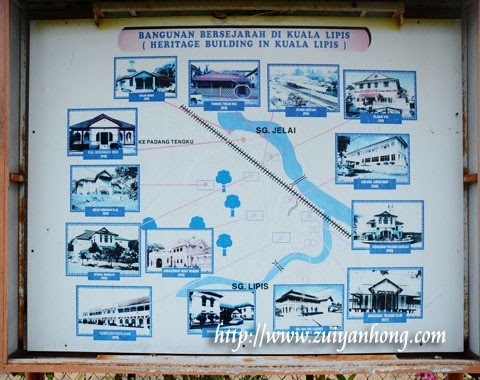 This photo is about the locations of various historical sites of Kuala Lipis. 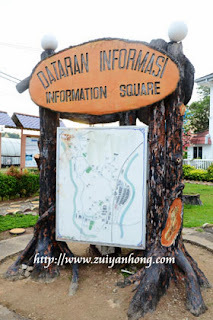 Kuala Lipis was once a place of tin and gold mining. That's why there are many historical buildings left by the British who had operating mining in Kuala Lipis. This white post office is next to information square. Built in 1910, the history of the post office is more than a century. In order to facilitate the delivery of mail, a railway station was built beside the post office. For your information, the post office is still running currently. There is a zero km milestone in Kota Kinabalu. A zero km milestone is also available in Kuala Lipis. Based on historical record, this zero km milestone was erected in 1890. 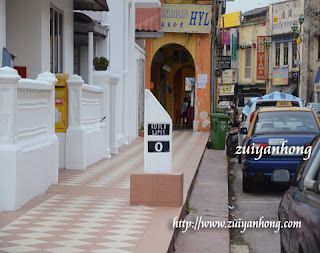 The calculation of the distance between Kuala Lipis and Kuala Lumpur starting from this zero km milestone. 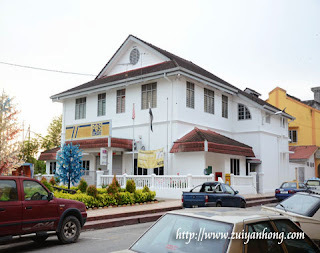 I will post article on Pahang Club, State Mosque, SMK Clifford, railway station, Tianhou Temple, Clifford residence, Kuala Lipis old town and accommodation information.